The D23 event "Destination D: Walt Disney World 40th" was the primary excu...reason for this trip. While waiting for D23 to announce when tickets would be on sale, D23 held a screening of Bambi in Chicago on the big screen on Feb. 2. I attended, and was able to learn from the Disney Geek himself there would be 1300 seats available for Dest D in May. I tell PiC (might have been at Bambi, they announced the date a couple of days before that event) that D23 has finally announced the day Dest D tickets go on sale, and if I get a couple, we're going to the World in May. At least for the days of the event, plus a couple more on either side. She says okay. She'll mark it on her work calendar. All set for the event, right? Easy, right? What makes you think anything in my life is easy these days? Jenny is doing a BYPT trip in May with her SiL. (See her trip report. I'm sure she's going to write one. (And she did!)) SiL is leaving Friday morning. She was going to solo through the weekend. She plans on leaving Sunday night. December 3, 2010. 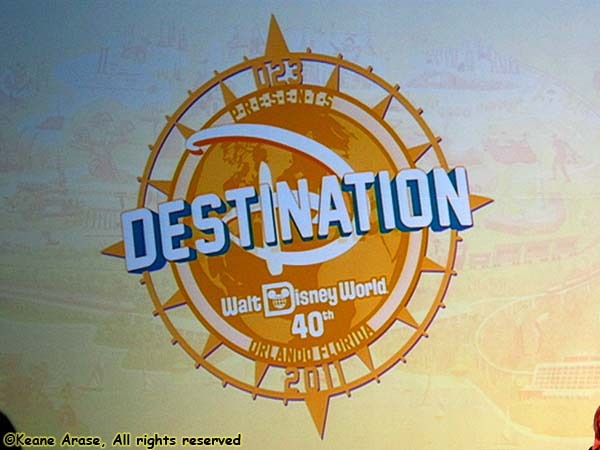 D23 announces "Destination D: Walt Disney World 40th", to be held May 14 & 15, 2011. February 6, 2011. (or it might have been the 8th, but it was still in 2011), D23 announces Dest D tickets will be on sale Feb 24. February 24. Buy 2 tickets to Dest D. Since Annual Pass (AP) rates haven't been announced, I make Garden Room/Garden view reservations at the Contemporary Resort with the standard 30% discount rate. I will note here in case anyone from Disney is actually reading... If you're a totally clueless Disney newbie, and you go to the WDW web site and look at the resorts and try to book a room from there, you're rewarded by being quoted full rack rates. Sticker shock. Close the window, go to the beach. If, on the other hand, you just click another tab, you'll find a discount page, and can book many of the same rooms at a discount, which is much more palatable to the wallet. It would be easier for the totally clueless Disney newbie to be sucked in. Just sayin'. March 18. I finally hear back from D23. My guest's name has been changed to Jenny. I send her e-mail: "There's no turning back now..."
March 20. PiC finally decides the can arrive on Monday May 9. She cannot be gone for mother's day. On the other hand, I'm going to be gone for not only for mother's day, but my mom's birthday. (I'm going to pay for this, I think...) PiC is going to leave Thursday, May 12. March 21. I start a search on WDW's AP site for a room from May 9 to May 13. In my December Trip report, I said one day I would stay at Wilderness Lodge. That day will be May 9 and continue through the 13th. So lodging is all in place. Four nights at Wilderness Lodge, and three nights at the Contemporary. This is already becoming my most expensive trip yet, and I'm not even there yet! April 10. PiC finally makes her plane reservations, and will arrive 11:00am on Monday. I don't expect to hit Orlando until about 12-1pm. I could be later. PiC says it's worth the $100 she'll save by taking this flight, rather than a later flight. I wonder what my baggage fee will be. May 4. PiC begins to change her mind about waiting at the airport for what could be hours, and asks what it would take to get on a Magical Express Bus. What, do I look like a Disney Expert? May 5. I call Disney and ask how to put PiC on a Magical Express Bus. After speaking numbers and punching a bazillion buttons on my phone, an voice tells me I'm going to get to talk to a live person. Less than a minute wait after dealing with the automated pre-show, I get a real human and find all I have to do is give 'em the date and her flight number, and just for the inbound trip. (I'm taking her back to the airport.) Since she won't have any luggage (yes, I'm charging her a baggage fee) she doesn't need any tags. Just a photo ID, and get on the right bus... That was easy. I think it was even during my free long distance window. So I'm exchanging shorts for long pants and eliminating the sweatshirts (except for one, which eventually earns me points from Jenny), and I'm packed, yet have all this room in my roller duffel. Because of this, I have two other bags I normally take are eliminated (they're actually inside a larger Eastpack). I keep looking it over thinking I'm missing something, so instead of going through everything one more time, I take it out to the car. Out of sight, out of mind. Also make sure my floppy green hats (I have two), tripod and monopod, are all in the car. I have forgotten these things before, and regretted it. Also my folding two-wheeler, pop, snacks, and Lisa's potato chips are in the car, things I won't have to do tomorrow morning. PiC drops off her Eastpack. She thinks she's sick. I hope she's comfortable sleeping in the lobby at Wilderness Lodge. End May 2011 Trip Report - Part 1 of 9.